What paints have the most pigment? Which brand has the brightest UV colors? How do you use the petal brush? We know you have questions, now you get the ANSWERS!!! Don’t miss out on learning about the products you need to make your job easier. Join us for this informative session and walk away with new ideas on how to use the products available in the vendor room. Have You Considered Adding A New Skill to your Knowledge Base? How about WINDOW PAINTING??? Join in the yearly class where everyone shares their nifty ideas about now to make your life easier and your job even more fun. Painters and Twisters join us to learn a new trick that will help your business. Please get with Arla before the class and let her know you want to share – we have limited time and lots of talent!!! From snakes to lions, Jocelyn will show you how to create different styles of animal faces that will help you express your creative side and still make your client happy. Christmas, St. Patrick’s Day, Easter and more….in this class, Jocelyn will show you some of her favorite go-to holiday designs that are quick and effective for any time of the year. This class will take off from the past 2 year’s. You do not needed to have attended either of the other two classes to attend this workshop. This year we are also teaching the making of fairy wings. All supplies provided (there is a $25 supply fee). The basics of making your own head piece. You will learn how to make a head piece by using a visor and head band, and using different materials to make them come alive. I believe you can make these as simple or elaborate as you want when knowing the basics of how to put them together. Come and join us in the jam room it’s going to be a great time. I also have a few new elements for the class this year so keep your eyes open for the class day and time. From Kitty cats to Lions and Tigers! Bring your cats to a new level!! The best of Dia De Los Muertos! From simple to extreme. Don’t miss this class! Learn to up your lettering and make the crispiest, cleanest lines for tribals!! Join Nick as he paints his best dinosaurs on the face! Anatomy, placement and styles will be focused on so you can mix and match to create your own Cretaceous creatures. This class has been 65,000,000 years in the making! Watch Nick demonstrate and explain airbrushed faces! He will discuss technical aspects and well as technique aspects while painting his favorites from Halloween Horror Nights and other haunted affairs. This class is perfect for anyone starting out or thinking of expanding their services. Starting with proper inflation, tying knots, and basic twists and terms. We’ll cover designs are easy but impressive, simplicity at its best. Without any elaborate or complex twists these designs will amaze your audience. Big Ones!-Advanced Anyone is welcome! We’ll be making some of my personal favorites, using larger 360s and 660s. These aren’t really feasible for line work. I’ve used them at private parties, trade shows, festivals and on stage during shows. They are sure to draw a crowd and make someone feel really special. Bring joy to the little guests in your chair and remember what it was like to be a child. This class will be all about the designs that let children (and adults) pretend and they let you be a part of making that few minutes of interaction with you memorable. Let them scowl and roar and chomp and help them make up stories to tell their parents & grandparents. These designs are also the ones that get shared more on social media, make parents react to children sometimes ignored, engage boys more to increase your marketing opportunities and give YOU the opportunity to LOVE your job like I do. Make yourself memorable and a small part of the lives of your clients. You will leave with an renewed enthusiasm about the job we do, lots of designs with a humorous twist and an ability to share it with your clients. Most face painters have to deal with long lines at festivals or “free to public” events where speed is a must. You must be able to paint at least 20 faces per hour or more to be competitive but how do you keep your quality high enough to maintain a good reputation? 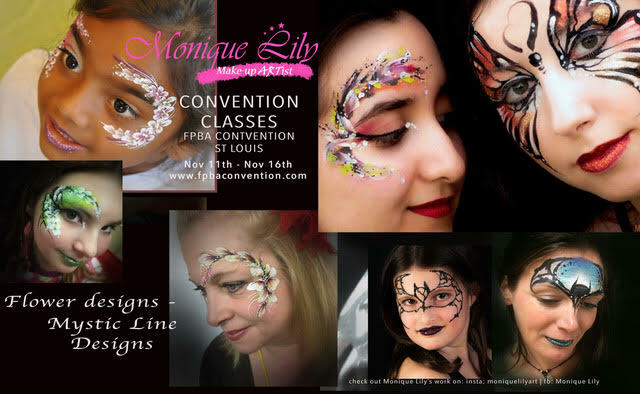 I will show you how to make 1/4 & 1/2 face designs, using one-stroke technique, that will impress those in a “Free Face Painting” line so much they will want you at their private event and your client will be inviting you back year after year. We’ll also be sharing tips and techniques for speed events that will maximize your head count. Gem Basics is a class for all levels. In this class you will learn the basics to paint realistic, 3-D effect gems. You will learn about direct/indirect light and shading; different kinds of gems: colors and shapes. This will be a hands–on class experience where you will have the opportunity to practice and explore your creativity. Now that you’ve learn all the basics from the Gem Basics Class….in this class you will learn how to incorporate Gems into your designs. You will learn how to create beautiful necklaces, bracelets, etc. This is a hands-on class experience. Description: Do you struggle with coming up with your own designs? Most of us began our face painting careers by copying existing work. Hey, it’s a great way to learn! But at some point, it’s time to branch out and develop your own style. In this class, Pam will guide you through her creative process of design creation. She will tell you where to find inspiration, how to think creatively, placement, balance, how to bring it to the final design and more. She will paint some of her own designs while walking you through her thought process. And help you to develop a small design as time allows. Burns! Cuts! Blisters! Oh my! FX 101 will teach everything you need to start adding FX to your services. We teach cuts, burns, blisters and so much more. You will be shown tips and tricks to set up your own FX kit, without breaking the bank! Learn how to market your FX business all year long. Welcome Foolish Mortals! Do you want to be part of the wonderful world of haunting and make a fantastic living? Well you are in for a treat! This class will teach the tips and tricks of becoming a make-up artist, for ghoulish, scary, morbidly funny, and haunting make-up applications. Covering building your kit, FX looks and much more. Marketing yourself to our special October clients. Tips and tricks on how to speed up your application without jeopardizing the quality of your work. Been on the fence about buying the amazing Wiser’s tattoo pro stencils or already have them but have been collecting dust . In this class we will go over the basics of how to use them , best inks to use , setup and marketing for airbrush tattoos plus more! You don’t have to be a professional tattoo artist with these lol. Only have three tattoo pro stencil sets no problem. In this class we will show you how to Incorporate Wiser’s tattoo pro stencils and things most of us face & body painters already have in our kits to make out of this world tattoo pieces ! Take your tattoo game to the next level !!! From ages 2 to 92, everyone loves bubbles. You will love the extra $miles bubble$ bring a$ an added $ervice to your busine$$. Secret formulas and a trick or two. Put a bubble inside of someone and put someone inside of a bubble. This is where you learn how to get started offering good clean fun. When that line is one and your time is short these designs will get you through!!! I can show you how to speed up those designs without losing your great look or style and still make everyone smile when they look in that mirror. Come join us and improve your SPEED!!! We will do different styles of roses and other flowers and create different floral designs including calla lilies. Everything you love about flowers will be taught in this class. Learn from the “flower queen” and please those girls of all ages!!! In this class you’ll learn how to create depth and bring your designs to a third dimension. We will do realistic looking and detailed designs and learn about blending, contouring, contrast, proportions, light and shadow. The dreams that you dare really can come true! Now is your time to move up to serious makeup effects. This class covers techniques of using water and abrasion resistant makeups like classic alcohol activated make-ups like BIC and Encore and or new Solids. Along with airbrush or classic face paint you can offer something few will. With improved skill you can enhance your to festival line-up, land a spot on a film crew, even in a seasonal kiosk or haunted attraction. Add or enhance an airbrush face and g-rated body art business for schools and corporate clients. Gain an understanding on what type of equipment and, how to set-up for one or multiple artists using three or dozens of airbrushes in an ergonomic style for healthy, fast paced work. Hands on this class with learn to blend colors for a three brush system that allows you seven colors. Airbrush tattoos are far from passé’, learn to curate good, effective designs and arrange manageable displays. A great set-up and your artistic flair is nothing without a distinguished, repeat client base. Like bands of the rainbow putting all these together will brighten your financial world. 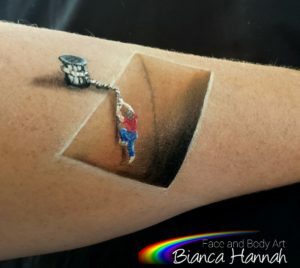 Your pot of gold is at the end of the rainbow in airbrush face painting. This class will teach you how to get started or enhance an airbrush face painting business. This class offers hands on instruction on using stencil based designs and durable, yet washable, makeup. Both Stencil Eyes and ProAiir Hybrid meets these needs. Working with this system the class will cover the quick simple faces through having students employing freehand techniques for advanced looks. Student will conquer the fear of airbrush around, eyes and lips with some easy techniques. Painting with powders, use the unbelievable ShimmerGLAMS and make your faces WOW the crowd! In this class, Lenore will teach you how to use powdered pigments to create adorably amazing face painting creations that will be a huge hit at your next event! Ideal for theater makeup as well as the sweltering heat of summer, she will show you how she creates her most requested faces that are loved by children of all ages. The next time a child (or adult for that matter) sits in your chair with sweaty hair and a forehead dripping like a faucet, FRET NOT! Lenore and her powder techniques have got you covered. Do you struggle with your butterflies? Are they your greatest nemesis? Struggle no more with Lenore’s intro to beautiful butterflies! She will teach you several techniques and designs that will be sure to help cure you of your Lepidopterophobia. This class is ideal for people who are excited take their butterflies to the next level. Did you grow up in the 80’s and 90’s? How many sticker albums and Trapper Keepers did YOU have? Lenore had a zillion! And many of her favorite designs to face paint reflect that. Let her guide you through a world of unicorns and rainbows, ice cream cones, brightly-colored candy, wacky animals filled with sass and jazz hands, and so much more! This class is for the Lisa-Frank lover in all of us. And yes. There WILL be GLITTER. See you there! This class will cover the importance of a contract and cultural sensitivity while providing henna services. Learn how to approach henna bridal parties and private events. We will cover the details of henna for library programs, festivals and markets, set-up and menu options for the different events and venues. Big faces may be all the rage, but some parents (and children) still just want a little CHEEK ART. Come see Robbie show you how to do cheek art in a quick, fun way that will still bring smiles to faces of all ages. Do You Send Thank You Cards to Your Customers? Well, You Should!!! Robbie has a special way to make creative cards that are a great way to say Thank You for Your Business to Your Customers or even just make some for everyday use. Learn some special melted crayon techniques that make beautiful cards for all occasions. I will show you how easy it is to make your own ProAiir plastic palate in this class, and paint like a pro with just a few colors. Learn how to use watercolor techniques on the skin! After this class, you will be able to add waterproof options to your arsenal, no airbrush needed! This class is perfect for those students who love to paint on canvas or paper! Learn WHY it is so important to be on top of your game by offering the waterproof option to your potential clients in all four seasons. The daunting part of painting a sugar skull managing the time you invest to successfully remember and render all the components that are missing from a traditional skull. The roses, the leaves, the filigree, the spider web, the key hole, the perfect nose, the right size eye socket… It’s one of the fanciest face paints by far. Learn my personal short cuts that will minimize time with clients, while still producing a sugar skull that knocks it out of the park. Have extra time? Make it EXTRA fancy for them, and learn how to upsell this look! Learn the history behind this beautiful and honored face which has evolved from tradition, into American Pop Culture! Now you will easily earn the skeleton keys to bring out your inner skull! Learning to master Specialty Brushes: We all have that lonely specialty brush, tucked away in the corner of our kits that we never remember to use. Why do you need it? What can you do with it? Well, I’ve got some tips for you! Using La Cornielle “Flora Brush”, Black Gold Dynasty “Hat Trick Brush” and “Whales Tail Brush,” as well as a few others, I can show you how to use these brushes to bring fast “Wow Factor” punch to your designs. In this class, we will explore furry, feathered and scaly textures, as well as some fun, stamping techniques. Bring a small paint kit and your specialty brushes if you have them. This will be a hands-on class. Learning to master Specialty Brushes: In part one; we learned how to properly load our specialty brushes for magical effects. Now let’s bring it all together and do some full face designs. If you didn’t make it to the first class, don’t worry. We will be doing a quick refresher at the top of the class. Again, we will be using Using La Cornielle “Flora Brush”, Black Gold Dynasty “Hat Trick Brush” and “Whales Tail Brush,” as well as a few others, to bring fast “Wow Factor” punch to some full and half face designs. Although many of us have used a dauber now and then, it truly is an amazing tool for speeding up your line with a quick and impressive touch and to give a ombre effect to so many designs. We will discuss 20+ superfast and easy designs where a dauber makes all difference. Prepare to paint, we will create as many in class as the time permits. I will provide the daubers and it will be a hands-on class. One of my most popular techniques is a stained glass style of painting. As artists, we love to explore different ways to create something unique. Come and play using linework and glitter in a style of painting that shimmers and pops. I will show you how to create dragons, unicorns, dolphins and more using the stained glass style. This is definitely a hands-on class so be prepared to paint! Before you start spending too much and wondering if it is all just too overwhelming, come learn how to get started by making smart choices. This class will concentrate on how to get organized, what pitfalls to avoid, what opportunities are out there, how to become your own best agent…and MORE. From making sure you are heading toward success to keeping your expenses at a minimum, let’s get you started in the right direction. What should your online presence say about you? Are business cards that important and what should they say? Do you need a logo? How do you find your niche in your area? Winter brings such beauty…even the new fallen snow shimmers. Join Marianne and Barbara for this festive class where you will have 2 teachers to inspire you with winter designs from adorable to elegant, just in time for the holidays! Paint, have fun, and leave with the spirit of the Season! Learn how to create some of the coolest UV/Neon face paint designs for all your events this will give a new WOW effect to your designs with this one of a kind technique!! You may already have neon paints and you just don’t know you do or how to use them, don’t miss Gio’s class!! Want to add some envy to your basic green designs? Then this is the class for you, time got get off the sidelines. This class is interactive, a partner you will paint, so come join the adventure, our designs will be anything but quaint. You are already putting priceless smiles on the kids with your face paints. How about using the technology of your smartphone at your fingertips to capture those priceless moments? Or to create that extra “wow” factor when a potential customer browses your work either on your site or social media ? This valuable class give you all the tips and tricks you need to use to make your business a cut above the rest by using readily accessible wonders without a professional camera. Learn how to make perfect and fast flowers and how to flower designs! My favorite lines to make…. If you want something different with your basis designs….. replace your lines with Mystic lines… they’re beautiful, fun and mystical…. In this fun-filled class,Donna will share with you her very favorite Zoo fun designs using rainbow & split cakes. She will show you how to utilize your cakes to their fullest advantage, while having some fun & laughs as you learn! This class will also give you great tips on having fun with the children in your chair, giving them their moment to shine! Get ready for a fun & magical trip “Over The Rainbow with the emphasis on fun! Learn strategies for some terrific bird designs to add to your board! In this class we will cover developing custom bird masks, adding humming birds to floral designs, and creating easy one-eye bird designs with personality. Hands on class, come ready to paint! How to increase market share in your area and avoid some common pitfalls. In this class we will talk about beginning to add contract workers to your entertainment team. How do you train and establish expectations, and manage multiple artists going to multiple gigs with differing ability levels? We’ll also talk about branding a group of artists, figuring out a pay/profit strategy, and keeping your booking and staffing systems simple. If you have thought about increasing your team by one artist or ten, or would like new techniques for booking groups, this will give you the starting place you need! More tips and tricks to take your balloons to the next level. Our focus is making good balloons great by following a few simple rules. Topics will include artwork, proportions, cleanness of presentation and tightness of structure. Also, add-ons such as stickers, feathers and bling. So you want to do headbands. Every aspect of doing headbands will be discussed. From what can be put on headband, how to attach it and what headbands to use. Examples of simple but high impact headbands with big WOW factor will be taught. These are the balloons that I make at each and every job. The ones that are the most requested and the ones that get the biggest reaction from both kids and adults. Whether they are put on sticks, headbands or bracelets, they are just adorable. In this class Tamina will show you how to add a touch of spice to any design by adding her Rockin Graffiti stencils to it…..I will show you how to make these stencils work for you and show you there are so many variations you can do with them…Her motto is always be free with your art. Do what you know you can do. Be yourself, keep it cool and funky. This will always creates a wow factor. In this class we will share essential knowledge you need to know to achieve PERFECT transfers using your face painting stencils! You will attract face painting success on so many levels…! Getting clean transfers, how to use them on kids successfully, and how to keep the stencils clean while working so that integrating the art of stenciling into your painting process is fast and efficient! Learn different types of face painting products such as water activated paint versus pressed powders, and how to use them so that you can use to get ideal transfers no matter how much experience you have. Donna “Rainbow Trout” Trout and Jill “Silly Jilly” Schmidt will teach sculptures that take about two minutes or less to make. Students choose which designs they’d like to learn. Donna Examples: Panda on a stick, tiger, helicopter, baby, brontosaurus, Diamond Sword, wands, double stuffed ideas, using 5″ prints, flower bracelets, bow & arrows, ray gun, and flying mice, etc. Jill Examples: Horse, cat, shiny sword, poop emoji, dog, unicorn horn headband, John Justice basketball game, axe, alligator, caterpillar, large flower, Spunkybeans’ sprinkle wand, Minecraft Creeper, Marshal from Paw Patrol, one balloon bracelet animals, Kylo Ren lightsaber, snake, elephant, and several hats. Calling all balloon newbies!!!! Are you brand new to balloons? Want to try it out to see if you want to add it to your entertainment services? You will have hands on training in this fun and informative class! You will learn the differences between the different balloon sizes, specialty sizes and prints, what you need to get started, etc. We will go over basic twists and techniques and you will learn to make a few balloons in your very first class! Balloon twisting is a lot of fun and can earn you more money so why not try it?! Headbands, bracelets, hats, wings and more! These designs are a hit for kids, teens and adults! Balloons are fun, being able to wear them is even MORE fun! Simple yet fun, cute and impressive designs that are sure to wow your guests! Learn simple tips to make you a more efficient painter leading to more money at events! This class will speed by as students use these techniques to complete a timed design! Time Management. This class covers a full six hour body painting and is broken down in an outlines schedule and has proven itself tried and true at competitions. This is NOT a face-painting class. this class will highlight technical tips and tricks to bring your portrait skills to the next level. Using her experience in both the tattoo and body painting industries and focusing on facial details, shadows and highlights, and facial positioning. Come and have fun with powders! In this awesome class Elisa Griffith will teach great techniques for working with her powders, or any other powders you can find. Powders are a great alternative to paint when it’s hot outside and they are amazing for so many things! From eyeshadow, to face painting base,contouring and stencil work! This class will show you how to maximize your use of them! So come join Elisa for this exciting class! Are you wondering sometimes what to paint on teens? No problem! Elisa Griffith will show you a variety of designs for girls and boys that will for sure impress them! Join Elisa for this class where you will learn different techniques and some tricks that will please crowds of any age! This class will focus on scaling up the size of your balloons to leave a BIG impression at your events. While there may not always be time to make the most detailed designs, there is almost always time at parties to go little bit bigger, or at least make something very memorable for the “Guest of Honor”. There are hundreds of thousands of designs out there, all just waiting to be tweak, modified and reinvented. In this class Clayton will show you his twist on some of his favorite borrowed designs and give you ideas on how you can re-work some magic on some of your own. In this class learn Clayton’s favorite line work designs; perfect for festivals, schools and all “free to the public” events. You’ll also get some of his tips and tricks for speeding up your twisting, closing your line, and saving your fingers. This class is so different and it includes techniques that no one has ever taught. I use embellishments, fabric, ribbon and other quick applications to add to the masks to make them look like real Mardi Gras Masks.These masks are absolutely magnificent, my customers rave over them. I think this would be a very popular class; and again, I can teach these masks for students in 3-5 minutes. These are also up selling designs and are on a higher bracket price per face. Sometimes the placement of a design like a unicorn or even the common butterﬂy can be the downfall of the actual design.What looks perfect on a ﬂat surface, does not always adhere to the curves and dimensions of each individual face.This class is designed to teach beautiful eye designs and the best and most ﬂattering way to place them on diﬀerent faces. Every working face painter has been asked to paint a hand or an arm at just about every gig. This class demonstrates a way of bringing that full face design and creating a sleeve or even a leg cover that wows the client and the child or adult that receives it. Margaret will demonstrate the simple way to create arm, shoulder and leg designs that can be done in just few short minutes. In this class Dennis will teach you a few different concepts on balloon weaving that will translate well into balloon hats and sculptures. In this class you will learn several of my newest two balloon designs that are quick and simple for line work, yet complex enough to blow their minds!!! In this class you will learn several very popular characters and body styles that can be scaled up or down for birthday parties or line work. Just in time for New Year’s Eve you will learn how to increase sales by adding balloon drops to your party offerings! We will learn how to make a balloon drop from scratch, test some of the pre-made versions, practice rigging, and discuss how to avoid potential problems. Best of all you will get tons of photos of your work so you can go home and start selling right away! If you like money, you should get to like balloon drops! No Experience or materials necessary! See what’s underneath all of those cool balloon arches, centerpieces and sculptures when they’re not wearing balloons! Take the mystery out of bases and framework so you can turn low cost air inflated decor into profitable sales. Perfect for beginner decorators or accomplished balloon twisters looking to elevate their already awesome sculptures. Skip the helium and hang your designs instead. We will create several hanging decor pieces that add big impact to a room in this hands-on workshop. Learn what to look for in a venue ceiling when planning and quoting your design. Then get photos and marketing materials so you can go home and sell these easy pieces. Do you panic when a kid asks you to draw a character on their cheek? Do your attempts at drawing characters look more like a fun house mirror than an actual cartoon? Then come to this class to learn how to draw cheek art princesses! Perfect for kids who don’t want to “be” a princess, or want the design on their arm. Down and dirty, nitty-gritty no fuss no muss crowd pleasing face painting. Dutches two signature classes combined into one crash course in cranking out mini masterpieces on the fly. I’ll show you a few new tricks you may or may not have seen. Different approaches to doing the same old things, but in new, better, and in some cases, faster ways. Designs books, ideas from Pinterest and Instagram, make these designs your own, hands-on class practicing certain elements and putting them together, sheet protectors will be used to practice on, but bring your acrylic practice board if you have one, and drawing pads work too! We’ll talk about what makes an ordinary face painting into a spectacular face painting. Then see examples real time. Come learn Quick and impressive modular designs that will help you be able to make dozens of designs from a few concepts. This class is great for beginners and intermediate balloon twisters. The bear head balloons will be provided. Unicorns and Rainbows! This class will teach you a variety of unicorn and rainbow designs that are great for line work, restaurant work and that extra special birthday balloon. This class is suitable for beginners who want to learn a few advanced techniques and designs. Do you want to learn how to make a fox, crab, llama and more? Come take this class and learn some cool balloons that will set you apart from your competition. All skill levels welcome. Business Class for All-Connie and Teri are sharing 45 years of experience. 30 of our best business tips !!!! Learn the best business tips on how to turn your “FUN JOB” into your full time job and not only love it but love the income, too! This class is for ALL ENTERTAINERS, not just balloon twisters!!! Come see what you are missing to take your business to the next level. Its sure to be fun. Every year we make the centerpieces for the banquet and we have a ball doing it and sharing our creations with all the attendees on banquet night. Join us to help be a part of the creation of fun and beauty. Five of my favorite Balloons. Do you need to breath some fresh air into some of your sculptures or learn how to create some new, fascinating designs? Then this class is for you. All levels of twisters welcome. Probably the most famous trope of Kawaii style art is faces – adorable faces on everything! We can see kawaii style faces in popular toys like Hello Kitty, Tsum Tsum and Funko Pop and in this class I will teach you how to easily emulate this style with your sharpie art. Suitable for linework, this super fast and super simple style of drawing will increase the wow factor of the balloons you already have in your repertoire. This class is full of tips and tricks including proper proportions and placement of Kawaii facial features. I will teach you dozens of expressions and, by following a few simple rules, you’ll be able to draw them in seconds resulting in fast, fun and adorable faces. I’ll even teach you a few of my most popular Kawaii linework designs! Keep It Sweet & Simple!! Literally meaning cute, kawaii style has grown from a Japanese trend to a global phenomenon. Kawaii style is full of rounded shapes and corners which translates really well into simple, yet adorable, balloon sculptures. In this class I will teach you some of my favorite Kawaii balloons for linework as well as a few more elaborate designs sure to impress. These sculptures work well with or without the Kawaii style sharpie class but it is recommended that you take both classes to get the most out of these designs.